Most know Craft for its famed Top Chef judge owner, Tom Colicchio, some for its impeccable cuisine and plating, others for its stellar wine program where refined dishes are paired with estate reserves, and anyone who’s had the pleasure of dining there, for its unparalleled customer service. 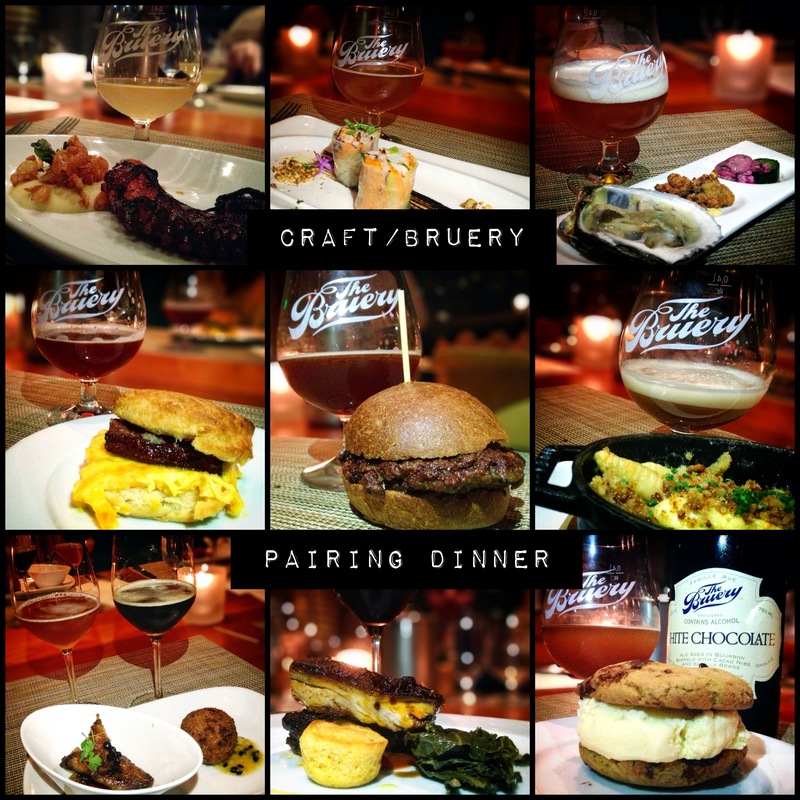 But few associate this five-star restaurant with beer dinners, which is why I was thrilled to be invited to their 10-course pairing last Sunday, featuring local California brewery, The Bruery‘s, seasonal and rare Reserve Society ales. As a former beer cicerone and writer, I’m always trying to educate my wine snob enthusiast friends about craft beer, touting the complexity of flavors and schooling them on the little-known-fact that there are actually more beer varietals than wine, making the frothy stuff an ideal beverage choice for enhancing and complementing different types of food often reserved for the grape-swirling set. So, I was instantly excited for this culinary journey through craft beer but curious how this seemingly unlikely duo came to join forces. Turns out, Executive Chef John Keenan is a beer lover himself, who just happens to be good friends with none other than The Bruery’s Benjamin Weiss, their fearless Director of Marketing and overall PR powerhouse, and likely the reason you know about the artisanal goodness that is their inventive brews (especially if you follow them on Twitter or Facebook). 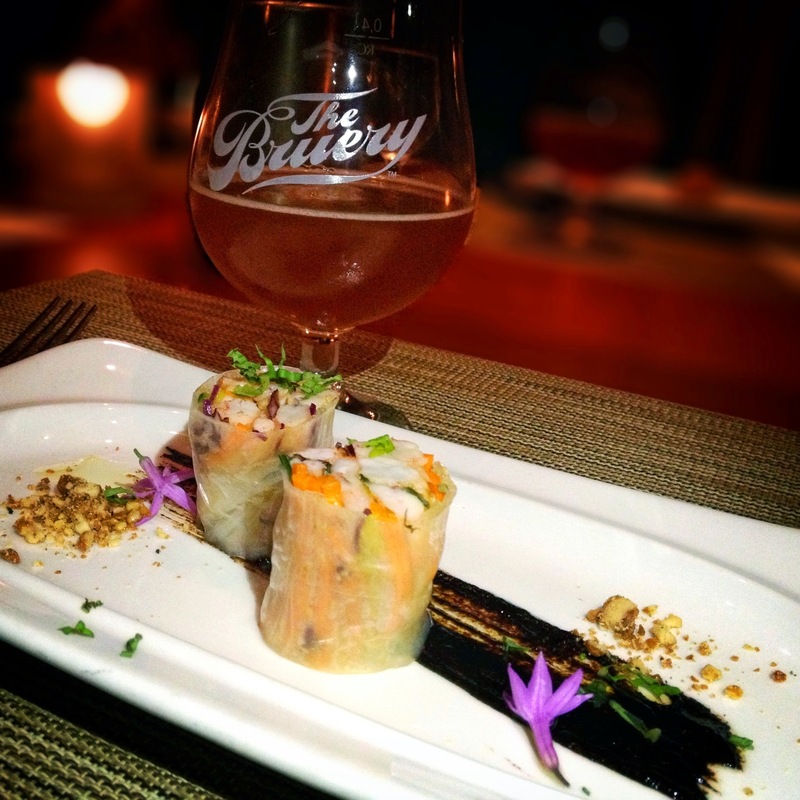 Craft already devotes a couple of handles to The Bruery, but Chef Keenan wanted to take that devotion to a whole new level in an elaborate, multi-course feast that showcased beer and fine cuisine in beautiful harmony. “I got to sample all of the beers first,” said Chef Keenan, “which I think made a big difference in creating pairings that were uniquely married to each other as opposed to trying to reverse engineer a dish to its beverage counterpart.” Chef Keenan also worked closely with his sous chef, Raymond England, and pastry chef, Shannon Swindle, who each played a role in planning the courses. “We had a creative vision that we developed together,” he continued, then added excitedly, “but we definitely didn’t play it safe!” And this playful collaboration resulted in one of the most mind-blowing meals I’ve had in recent memory. The first course set the stage for what would be an impressive mix of bold yet delicate tastes and textures to come. A perfectly grilled octopus hit its stride with big charred flavors infused into every bite, accented by a fluffy whip of Aleppo beans, which Chef Ray England referred to as a “happy accident.” He first attempted to fry the beans, which according to him left the bean itself “greasy and gross,” but the shell remained light and crisp. So, he decided to purée the beans and fry the shells, resulting in a sublime blend of silky mash with a light crunch. 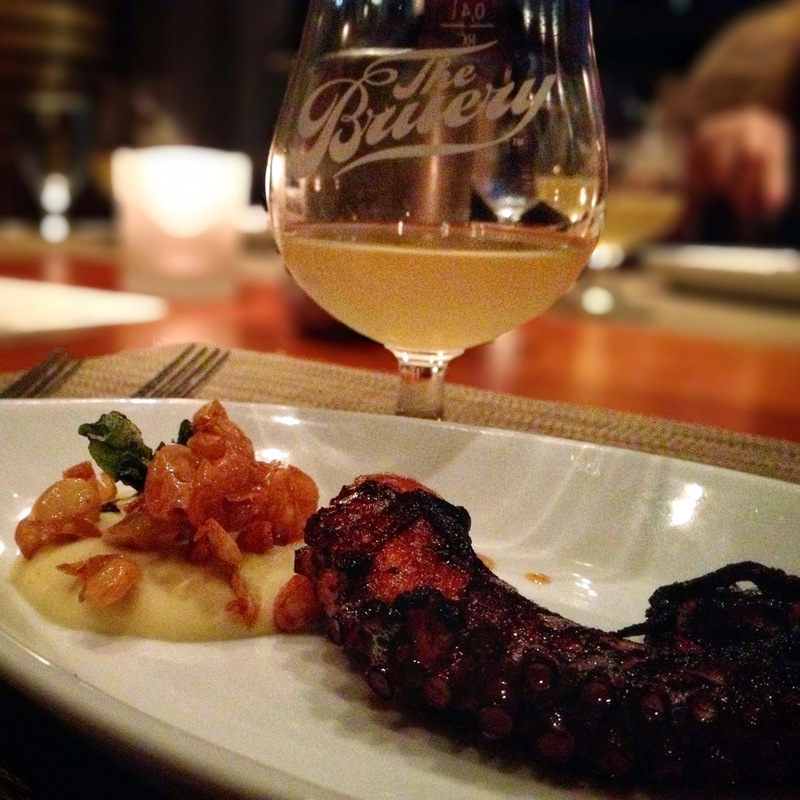 Accompanied by a sip of The Bruery’s Hottenroth Berliner Weisse, which on its own is a bit too tart for me, and you have the perfect zip of acid to cut the smokiness of the octopus and impart hints of fresh citrus on the finish. Off to an impressive start! The second course swept us from hearty flavors to the sweet tang of a spring roll, a dish that, for Chef John Keenan, was a “welcome departure” from the American fare he normally serves up at Craft. An example of the playfulness in preparation and plating he mentioned earlier, this execution was a re-imagined approach to a more classic Asian dish, served cold, with rice noodle skin, baby shrimp and root vegetables. Unlike the first course, where the food was bold with a lighter beer, this was more subtle to allow the strong flavors of the Saison Rue to shine, a symphony of spices with hints of clove and lemongrass that paved the way for a peppery finish. Unusual for malty ales, the Saison Rue was also very bright and juicy, enlivening the flavors of the dish and was especially complementary to the nutty caramelized morsels gracing the plate. My husband, David, may or may not have licked his clean. (He did.) I blame the 8.5% ABV. The adventure is now officially underway! Our sea exploration continued from octopus to shrimp to oysters in the third course where more of the chefs’ edginess comes through with oysters prepared three ways — a traditional raw version, baked and a new one for me, pickled. Diners were told to eat the oysters in progression from raw to pickled, taking a sip of the Mischief between each. The raw was bright and briny, coupled with a splash of the Mischief, imparted a hint of honey and melon, as it tends to be a more fruit-forward brew. The baked was a cross between an Oyster Rockefeller (sans shell) and a deep-fried oyster you might find on a classic po’ boy. This time, a swig of the Mischief brought forth rich malty flavors, followed by a bite of dry hops, which commingled beautifully with the zesty seasoning of the breading. The plump pickled oyster was as unusual as I’d expected yet delicious, leaving traces of dill and lemon on the tongue as the earthiness from the Mischief balanced it to create a ripened banana component that made me understand why peanut butter and pickles may not be such a crazy combination after all. 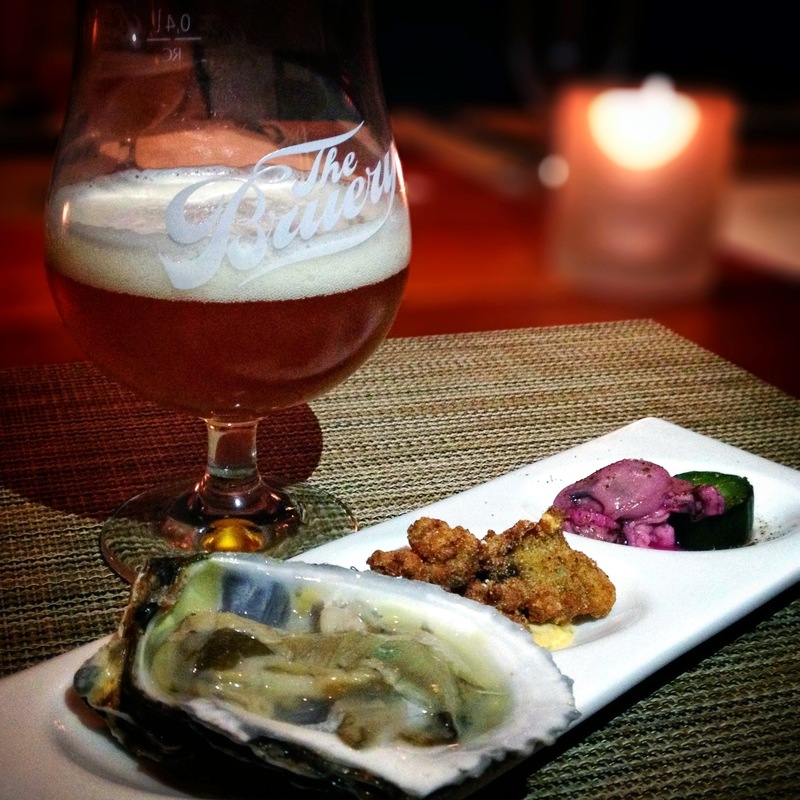 It was clear that each oyster execution was handcrafted to bring us on a flavor experience that highlighted the complexity of the beer. I was eager to see where they would take us next. 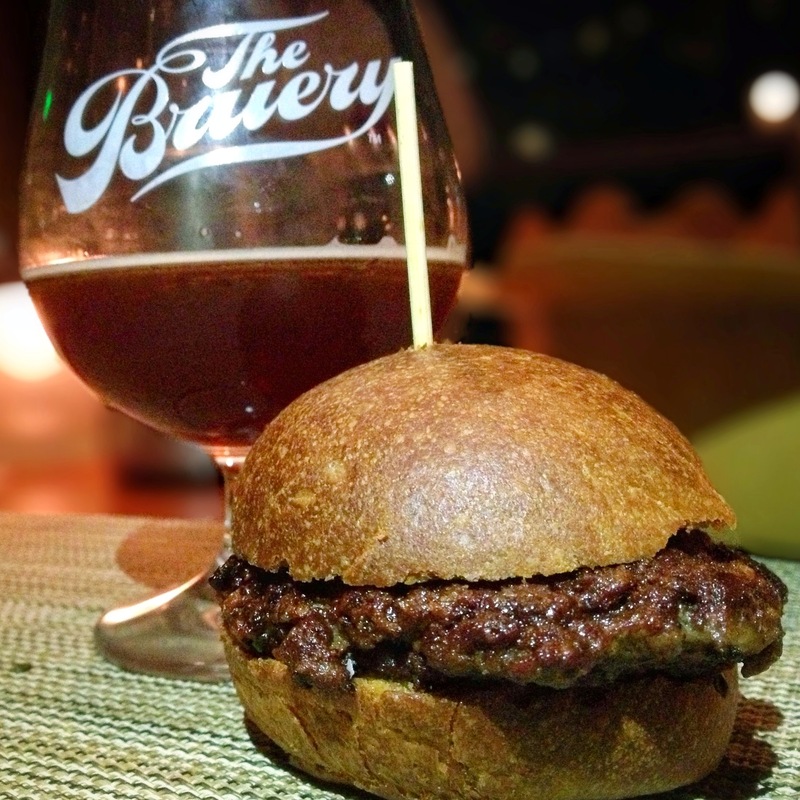 The fifth course appealed to the burger-loving carnivore in me, taking a beautiful cut of Niman Ranch grass-fed beef, who produces only 25 cattle per year, and transforming it into a slider with sweet onion jam on a wheat brioche bun. The meat was perfectly seasoned with a juicy glaze from the caramelized onions but the temperature was a little higher than I typically prefer, coming out closer to medium well/well-done, an unfortunate side effect of leaner, grass-fed beef which cooks quicker due to its lack of fat. Other attendees had what appeared to be a true medium rare that looked delicious, but I wasn’t one of those lucky few. Still, the burger was tasty in its own right, and I was especially thankful for the beer in this course as the vibrant, floral notes of the Loakal Red offset the denseness of the patty. There was also some underlying toffee flavors that added a layer of sweetness to the meat and cut some the dryness and salt. Even a less-than-successful dish was positively accented by a well-selected beer. And so I trudged on, still eager for what the next course would bring. The sixth course kept us on a comfort food track with Fusilli Mac’ n Cheese, whose simplicity of execution was juxtaposed by its elaborate orchestra of flavor. A secret six-cheese blend enveloped the baked pasta in a blanket of mild and pungent cheeses, revealing hints of sharpness in some bites and creaminess in others, all of which were punctuated by pops of bacon-y flavor from the smoked bits sprinkled on top. Because, really, what isn’t made better with bacon? But the real icing on the cake was the White Oak Barrel-Aged Wheat Wine, which poured a dazzling golden brown and delighted the senses with toasted brown sugar, vanilla and butterscotch. As smooth and creamy as its pasta counterpart, this brew brought a sweet edge to the salt intensity of the cheese, making it almost reminiscent of a chocolate and cheese pairing. David doesn’t eat cheese (yes, I still married him), so I had the added bonus of eating two of this course. With four to go, I find myself still surprisingly hungry, a fact I’ll pay for at the gym later, but at this moment: cheesy bliss. And let’s face it, a nice buzz. Off we go! 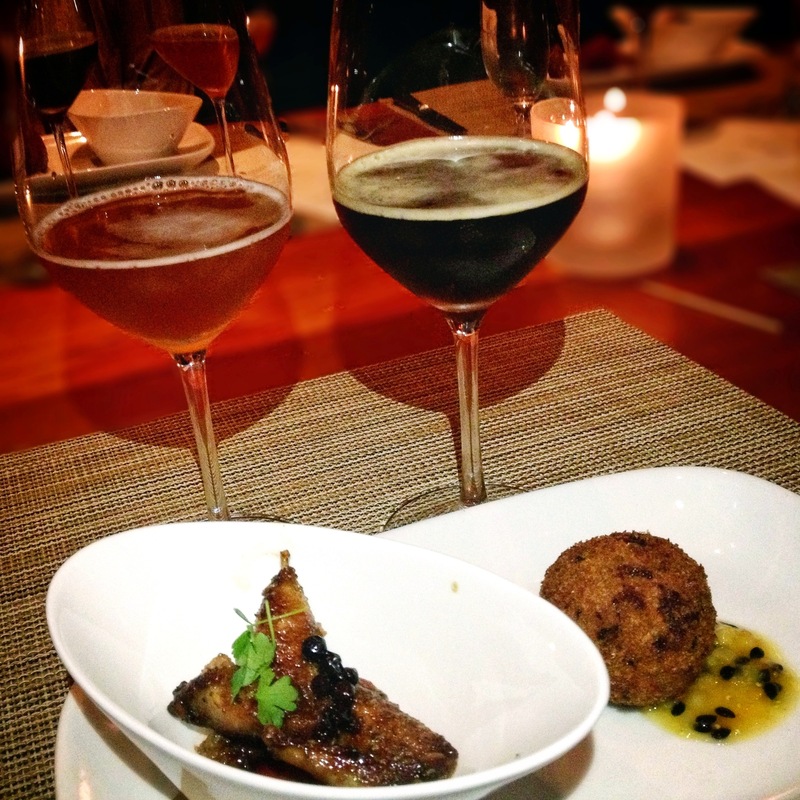 Courses seven and eight were served together to showcase their accompanying sour ales with game bird dishes that were high in fat and flavor. The seventh course was roasted quail, on the bone, to retain its juices, with sticky huckleberries, giving a whole new meaning to finger lickin’ good, and shifting an otherwise sour-on-its-own rye ale into a fruitier cider. Hints of ripe green apple and balsamic vinegar emerged from the sweetness of the quail, with an almost jammy quality that lingered to the end, leaving you with hints of oak barrels and herbal caraway seeds. It was all at once a flavor enhancer and palate cleanser as you moved on to the next course, a deep-fried duck fritter with guava reduction, using the Otiose Sour Brown ale, which is actually brewed with guava itself. 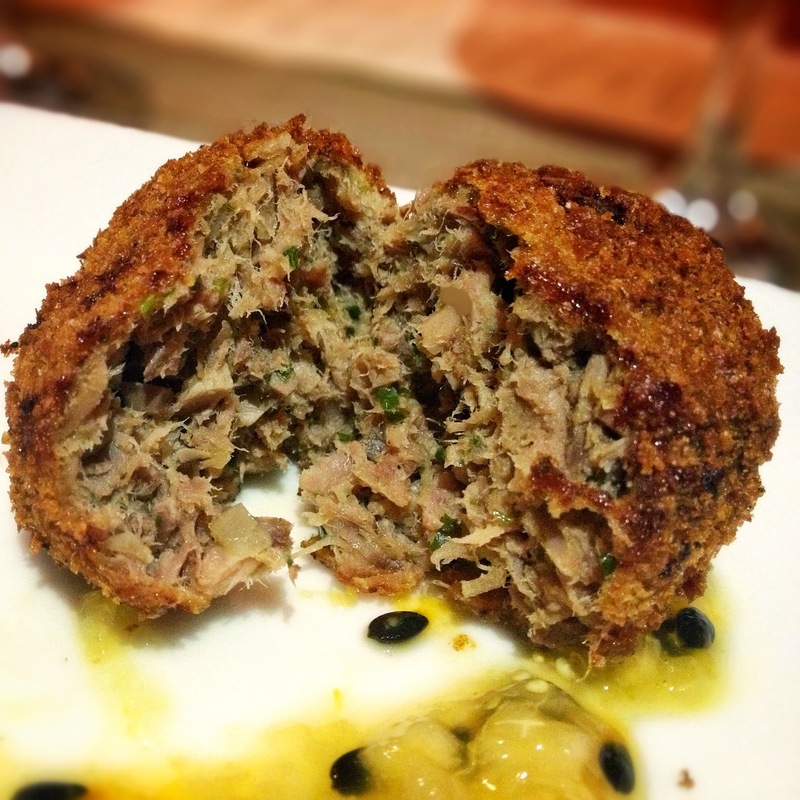 Crispy duck fritter, deep fried in bacon fat with a guava reduction. The penultimate course was another for the record books with BBQ lamb that was only 20% lean. You know what that means, right? 80% pure, luscious fat. If you’re going to send your guests into the hospital dessert course, this is the way to do it! The lamb was intensely smoked with a crispy layer of char, a technique Chef Keenan said he picked up at the Memphis World Championship BBQ Cooking Contest. If he entered this dish, he’d definitely snag the gold medal. 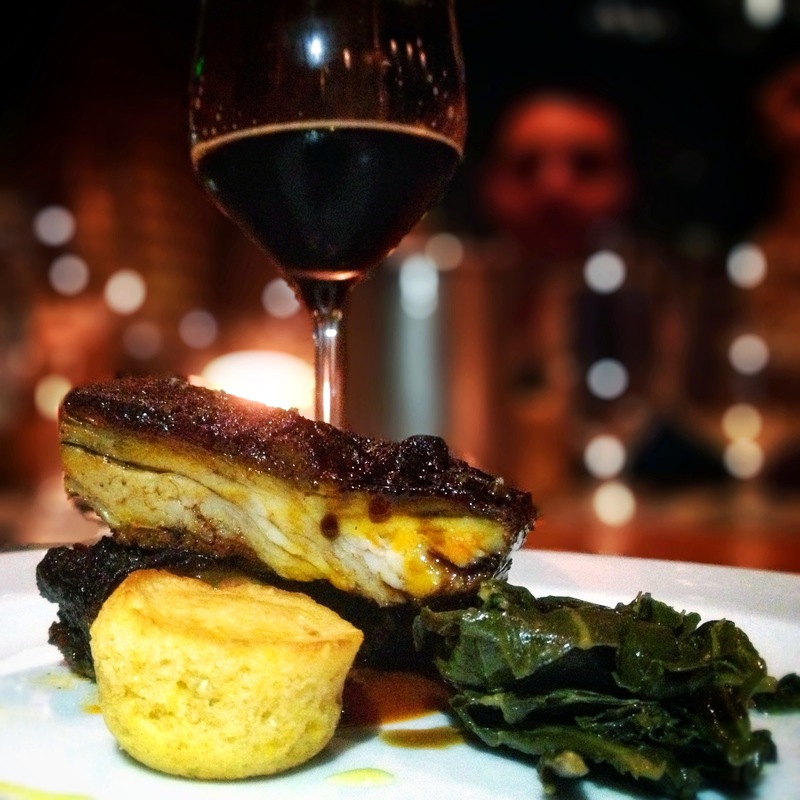 The meat itself was melt-in-your-mouth tender, similar in texture to bone marrow (see aforementioned 80% fat) and it’s velvety center was the perfect precursor to the exquisite finale to follow, augmented by a robust sip of the best smoked brew I’ve ever had. 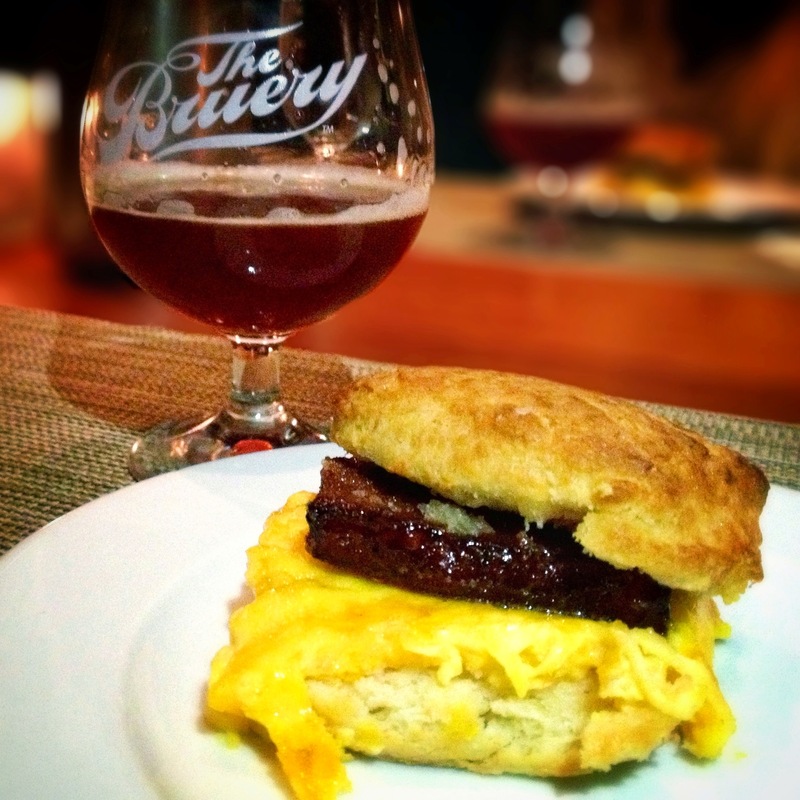 The Bruery’s Smoking Wood, one of their Reserve Society beers, brewed with beachwood and cherrywood malts and aged in Whiskey barrels, is like sipping a campfire. After you’ve toasted up some gooey marshmallows. There’s a woodsy smoke at the start that heightens the barbecue on the lamb, kicking in hints of whiskey and charcoal. Then, as your teeth sink into the lush, fatty center, sweet notes of sticky syrup and caramel usher in and taper off with a dark-roasted coffee finish. The perfect segue for dessert, and the beer I’ve been anxiously awaiting all night. 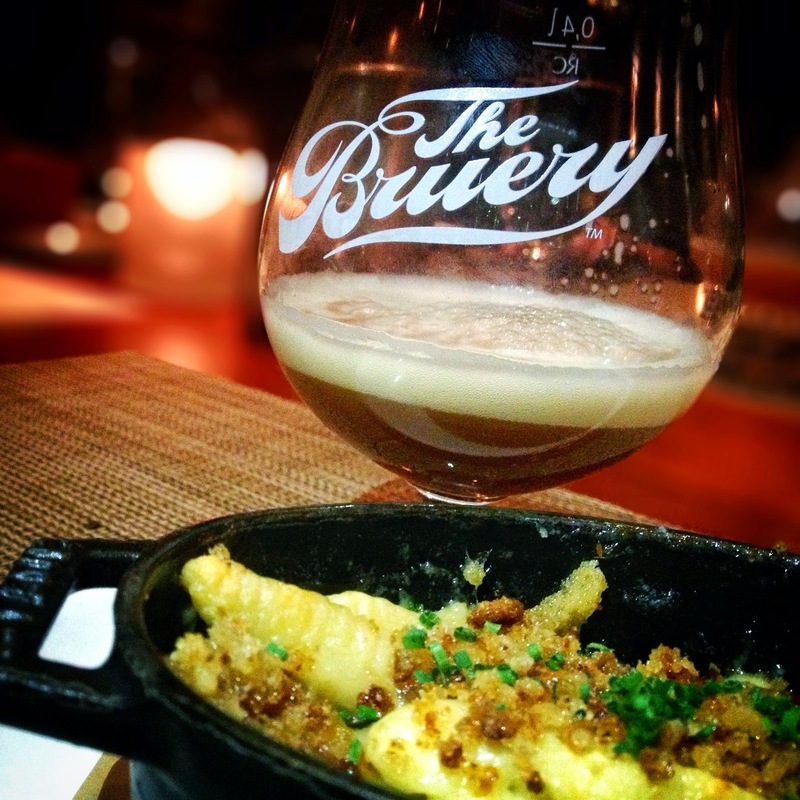 While, I’m typically a savory girl, the tenth course stole the show for me, in large part because I got to try the long-anticipated White Chocolate ale, which is, without question, the most inspired brew, and on its merits alone, worth joining The Bruery’s Reserve Society. I fell in love with the nose before I even tasted it, relishing the array of aromas that hit all at once — vanilla frosting, cake batter, freshly-melted chocolate, walnuts and rum — that awakened the senses and lured you in for a sip. And that first sip was glorious, reminding me of a white chocolate brownie sundae with its creamy mouthfeel and swirl of sweetness. Surprisingly, however, it’s not too sweet, and has much more depth than I expected, likely from the cocoa nibs which have a kick of bitterness and the wood from the Bourbon barrels its aged in. And as it warms to cellar temperature, it’s even more rich and complex, bringing forth flavors of cream sherry, vanilla muscat and a touch of root beer from the carbonation. It’s most definitely an after-dinner drink, and optimal as a sipping beer where you can enjoy the many tastes it elicits. 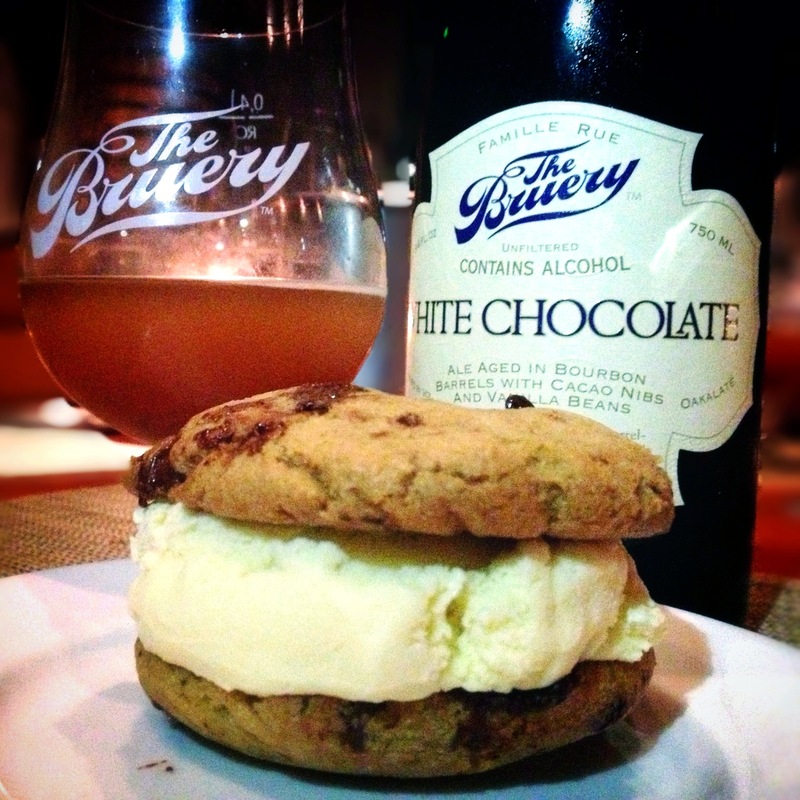 Aptly, it’s also delicious with dessert, and pastry chef Shannon Swindle knocked it out of the park with his white chocolate ice cream sandwich, which was made with the beer and brought more of a salty smack between the chocolate chip cookies. Bring on the food coma. After ten amazing courses and increasingly boisterous conversation with fellow beer lovers, I left happy and full, but wondering why Craft didn’t host more of these dinners. It gave the restaurant a more approachable air, and allowed for a fun, creative outlet for their immensely talented chefs. It was luxury without the pretense and while my group did get a wee bit rowdy, it proved that craft beer most definitely deserves a place at the table.